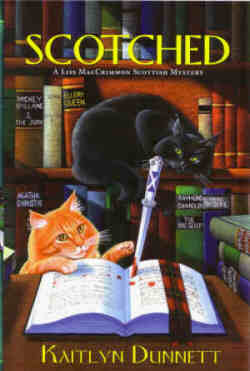 "Cats, Dogs, and Dastardly Deeds"
Kaitlyn Dunnett here, to talk about the ninth Liss MacCrimmon mystery, The Scottie Barked at Midnight. In some ways, it was a challenge to write this one. Dilemma: how to add dogs to a series that already has two cats? Solution: keep them (mostly) separated. 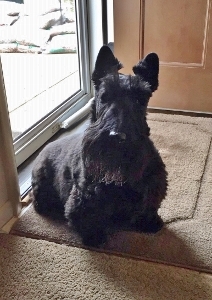 In The Scottie Barked at Midnight, on a cold and bleak March evening, Liss MacCrimmon is driving home from a shopping spree at the outlets in Freeport, Maine when something darts in front of her car. Afraid that she's hit a dog or a cat, she stops to look for the animal. What she finds, mercifully uninjured, is a lost and shivering Scottish terrier. She takes the little dog, a female, to the nearest vet and then agrees to keep her until the owner is found. She did not consult her two cats, Lumpkin and Glenora. Needless to say, neither is thrilled to have a house guest. Fortunately, the Scottie, Dandy by name, is soon claimed. Not so fortunately, Dandy was running loose because she was dognapped, and returning her to her owner leads to Liss's involvement in yet another murder. 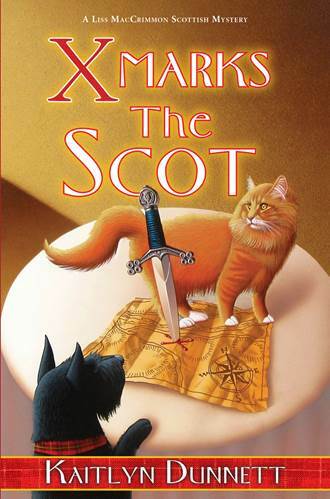 Lumpkin and Glenora were on the cover of an earlier adventure, Scotched. For The Scottie Barked at Midnight, it is Dandy in the cover illustration. In fact, there are two Scotties in the story, Dandy and Dondi, two-thirds of an act called "Deidre and her Dancing Doggies" that is primed to win the top prize on a television variety show . . . until someone does in Deidre. In need of another dancer to fill in for the murdered woman, Deidre's daughter taps Liss. She was once a professional Scottish dancer, after all. How hard can it be for her to learn the steps to accompany two trained pups? In fact, it is not hard at all. The hard part is figuring out who killed Deidre and who is behind the dirty tricks haunting the competition, before that unscrupulous person can knock Liss out of the running, too. Above are the Scotties who inspired Dandy and Dondi, the two Scottish Terriers who make their first appearance in the ninth Liss MacCrimmon mystery, The Scottie Barked at Midnight. 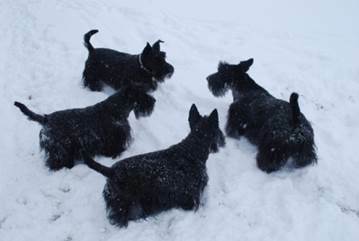 They are, clockwise, Doogie, Bentley, Maggie Rose, and Gracie and they are the companions of Carolyn Grande, the reader who first suggested to me that Scotties would be a perfect fit for my Scottish-American heritage themed mystery series. Cincinnati Scotty Friends, especially Julie Harrison, have also been supporters of the appearance of Dandy and Dondi in the series. Shown above is the committee that organizes their annual conference. 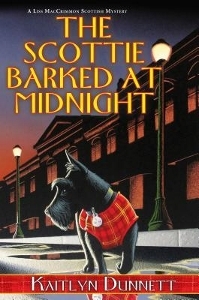 When The Scottie Barked at Midnight first came out, I did a mini-blog tour to publicize the book. Most of these talked about the Scotties. Below are links to some of these posts. 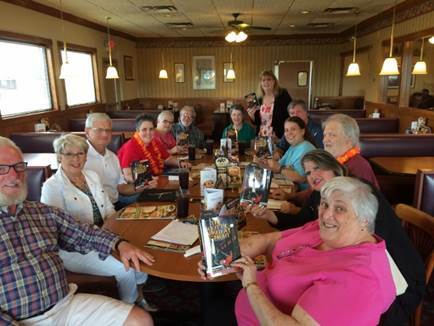 Fast Forward to later books in the Liss MacCrimmon series. 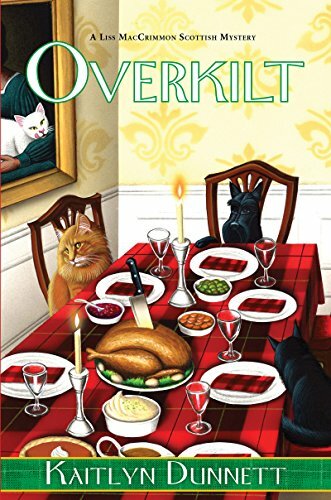 Back by popular demand, Dandy (or Dondi), now living with Liss's Aunt Margaret, again took center stage on book covers for the eleventh and twelfth Liss MacCrimmon Mysteries. More than that, they won new fans for the series, including Mark Roberts, whose excellent map of downtown Moosetookalook can be found elsewhere on this website. 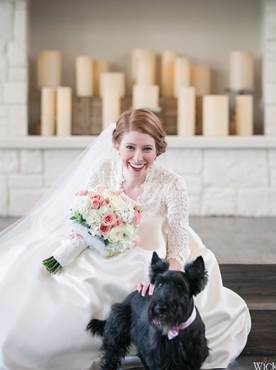 Here is a photo from the wedding of Mark's daughter Sara, where his Scottie, Carson, came in for his share of attention, too.